Guardian: Do we need a new language for miscarriage? I wrote an article for The Guardian about the language of miscarriage for Baby Loss Awareness Week 2018. I know. The bloody Guardian!! I sent off a pitch obviously not expecting that they would get back to me, let alone accept it — but they did. Second thought: Don’t mess this up. This is really really important. I decided to write about the language of pregnancy loss, because it’s just so wedded to the notion of failure. Even the term ‘failed pregnancy’ and ‘miscarriage’ suggest blame — as though we didn’t do our job correctly, we didn’t ‘do’ pregnancy right, we dropped the baby. When it’s likely that we’re already desperately questioning if there’s anything we could have done to prevent it; if it happened because of something we did (or didn’t do); if we did something to deserve this; if we’re to blame — the language only serves to exacerbate this. I only had a 700 word limit (which is NOT very much!) so there’s lots and lots that didn’t make it in — but I’m so very grateful for everyone who contributed to my research (more below) and for everyone who’s continuing the conversation. This post is to share some of these incredible contributions — from both experts I spoke to, and the real women who shared their stories. And OMG it actually ran in print. Like in a real newspaper with my name and my photo and everything. And it said I was ‘a writer about infertility and pregnancy loss’. Which I guess technically now I’ve written a paid piece for a national newspaper I suppose I am! 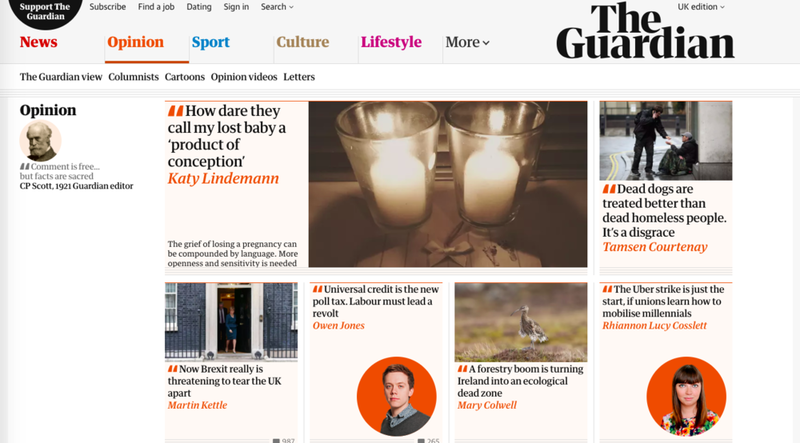 It was also pretty mindblowing to see the article when it was first published front and centre on the main Opinion page (apols for self-indulgence) — but so happy that a piece for Baby Loss Awareness Week was being given such prominence. I am so, so honoured to have been given the opportunity to write about this issue, and I’m thrilled that it generated such a positive response. A number of different charities shared the article: the comments were both heartbreaking to read, and incredibly heartwarming that so many people are speaking out about their experiences of pregnancy and baby loss — because it’s only by talking that we will #BreaktheSilence. These people were brave enough to share their own experiences, their voices deserve to be heard. I miscarried at 13 weeks August 29th: when it was described as “removal of pregnancy tissue” or “evacuation of pregnancy” it made my skin crawl.. it was our baby not just a clinical procedure. We were given excellent care from the support unit but once handed over to the surgical team to have surgical management all compassion was lost sadly. Absolutely agree people need educating on this! We were told I probably wasn’t pregnant anyway, even though we’d already had a scan with a heartbeat, that it was probably not a ‘real’ pregnancy. I went on to have a D&C, which didn’t remove the baby. I was at home alone when I realised, when I called the EPAU unit they laughed down the phone and said it was probably a clot and could I bring it in in a Tupperware?! This is the only time in my life I have been able to get pregnant and it still stings 5 years later! The lost part always makes me angry as well I didn’t lose him, I wasn’t irresponsible: he was my son not my f*****g car keys!!! Having an MVA (manual vacuum aspiration) for my third miscarriage consistently referred to by the doctor as an ‘abortion’ was surprisingly hard to hear. It’s outdated language that should never be used in a miscarriage situation. I would urge everyone to write to the hospitals in question to highlight anything from badly chosen words/phrases to poor care. Hospitals take complaints seriously and the message is passed to the relevant teams so they can try avoid it for the next poor woman/couple… Please everyone do this! I lost my baby at almost 12 weeks and the nurses who looked after me were amazing, not once did they mention trying again (other than saying it would be a possibility) they called my baby, a baby. They spoke with me about my grief and did everything they could to get me the last scan picture we had taken (baby had already passed but it was important for me to have it). On the women’s health unit, when it closes for the day any patients who stay overnight have their care managed by midwives. I couldn’t think of anything more cruel than a woman being looked after by a midwife when she no longer had a baby. The midwife had no compassion for the situation and ignored me most of the night. The doctor I saw the next day was vile! When I cried she was so patronising and told me “I know, I know, it’s almost like grieving..” I kept telling her to stop calling my baby a retained product and in the end I told her to leave. It needs to be dealt with more sensitively. I lost my boy at 17 weeks last year. They came in to take him and I said I wanted to spend time with him and hold him. I was told something along the lines of ‘what do you want with it, it’s not a full baby yet’. Although the NHS team who looked after me through two missed miscarriages and MVA procedures were so incredible and lovely the language they have been tutored to use was in my opinion wholly inappropriate “pregnancy tissue” rather than baby. Heartbreaking. I’m so fortunate that I am now pregnant again and in this happy instance they were more than happy to call the baby ‘a baby’ from our six week scan onwards. It doesn’t make sense. The language around pregnancy loss has to improve. I will never forget, and am still haunted by, the lady who did our scan at 7 weeks and informed us that “this pregnancy does seem to be on its way out”. It haunts me most because she had a trainee with her. And that pregnancy was our much longed-for child. I get really upset when medical professionals refer to my miscarriage as an abortion. It wasn’t an abortion. Having a miscarriage was not my choice. I’ve had mine referred too as products of conception too. And spontaneous abortions. Why don’t they call it what it is? MISCARRIAGE. A loss of a BABY. Just really makes going through a loss 100% harder. This was one of the worst parts of my whole experience. I completely broke down when my anaesthetist finally came to me and said ‘I’m so sorry for your loss’…the only member of staff out of probably 10/12 is dealt with on the day of my surgery that actually acknowledged what we were going through. Heartbreaking. I was asked have I passed the product yet I said what product you mean my baby that had a heart beat. I had a go at the doctor for the way they worded it. When we suffered a missed miscarriage of twins 2 years ago I opted for surgical ERPC. During the consent process the junior Doctor asked me “What do you want us to do with the biological matter after the procedure?” As a nurse (unknown to him) I went through the roof at him for his lack of empathy and instructed him to leave my room immediately. I then requested the registrar (female) came to consent me. In my professional capacity I do understand that the terminology was used as we were before the 24 week mark, however as a Mother I was devastated at the loss of my twins 4 weeks apart, not to mention the whole host of emotions I was dealing with. His words will forever haunt me. I wrote a letter of complaint but only received a generic reply. It is time that things change because a baby is a baby from the second you know you’re pregnant regardless of gestation and fetus viability. Having been told I’d had a “failed pregnancy” and that I needed a removal of the “products of conception” I relate to this so much. I was then made to go and sit in a waiting room full of pregnant women! All I could focus on was the word “failed”, as if I’d failed or my body had failed. It’s truly awful that there is so little compassion when telling a woman her baby has no longer got a heartbeat. I hate this phrase. Last year I went through an horrendous miscarriage requiring hospitalisation. All the time the Drs keep referring to our baby as a product of conception. Regardless of how far along you are, as an individual that embryo is your baby and part of you. You’d had all these dreams and thoughts about your future life with your baby, and in a heart beat it’s taken away from you. A ‘product of conception’ is not the right thing to say! I was overwhelmed by the reaction on social media — so sad that so many people had personal experience of this issue, but so happy that people were responding so positively to the article itself, and were comforted by this distress being openly acknowledged. The Miscarriage Association are doing phenomenal work to improve the quality of care that patients receive from clinicians when experiencing a miscarriage. The Miscarriage Association are also part of the National Bereavement Care Pathway: a collaboration with other charities and with the support of the Department of Health and the All Party Parliamentary Group on Baby Loss. The objective of the project is to ensure that all bereaved parents are offered equal, high quality, individualised, safe and sensitive care in any experience of pregnancy or baby loss, be that Miscarriage, Termination of Pregnancy for Fetal Anomaly, Stillbirth, Neonatal Death, or Sudden Unexpected Death in Infancy up to 12 months. It started with a pilot of 11 sites in wave 1, and is now live in 32 site across England, with pathway guidance for professionals on each of the five experiences of pregnancy or baby loss — and have published an interim evaluation of the project after six months live in the initial wave. Ruth told me that the hospitals who are trying it are enthusiastic, and that she hopes it will become mandatory to adopt the guidelines and training. Training about sensitive communication with patients really needs to start in medical and nursing colleges — and crucially, for clinicians to be able to deliver great care and act in a caring way, they need to be cared for and supported themselves. I was thrilled to learn about the NBCP, which is a fantastic step to deliver on-the-ground practical improvements to the emotional support bereaved families receive. It’s easy to say ‘we need more sensitive care’, but this project is actually working to deliver this, which is so encouraging. Miscarriage isn’t just a physical experience: it is an emotional event both for mum, her partner and those around them. However, a lot of the care given after a miscarriage only focuses on physical recovery, without providing women with the emotional support they need. We want to better understand the different feelings and ways of coping women experience after miscarriage, so we can find the best way to help those who have suffered loss. We also want to find out about the experiences of those working to care for couples that have miscarried, as well as how employers respond to miscarriages amongst their employees. Firstly, we are carrying out a large review of other studies on women’s experiences of early miscarriage. But we want to go further, and ask women themselves. At the moment we are working with nurses and midwives to figure out the best way to sensitively approach women about this difficult topic. The things we learn from this project will help us in training doctors, nurses and midwives to give women and their partners the care they need following loss, both emotional and physical. The project itself is exploring exactly the issues identified in the article, and I’m so thrilled that Tommy’s funding is going into researching delivering emotional, as well as clinical, care. Helen said they’re at the very beginning of the project, but that their initial area of focus is going to be on the male experience — because men are so neglected in delivering miscarriage support. Women are more likely to talk about their experience with their friends, but there’s no equivalent forum for men to have a space to be vulnerable and talk about their feelings. The aim is to to formulate or co-design with the participants what a helpful intervention might look like. I think this is absolutely fantastic, as miscarriage is a bereavement that affects both parents — yet so much of the support is geared around the woman’s needs, with the man’s emotional needs often barely acknowledged. Helen and I are going to stay in touch, and I look forward to hearing how the research progresses. Julia Bueno is a psychotherapist and counsellor, with a particular interest in supporting lost parenthood: supporting individuals and couples who struggle to conceive, or have experienced a loss during pregnancy or after birth. Julia was absolutely amazing to talk to — sadly she has personal experience of pregnancy loss, and brings this to bear on the support she provides to those grieving their own losses. She used to run a support group for Fertility Network UK, and now helps to facilitate a monthly support group for the Miscarriage Association. Next year she has a book about pregnancy loss coming out, called The Brink of Being — which I can’t wait to read. The language of pregnancy loss does have a chance of improving not unless and until we start talking about it more. Language evolves by playing around and words will get traction once we find a term that fits. Once we start muddling through — and maybe getting it wrong — then we can start to formulate better language and start to get it right. I’m enormously grateful to my amazing consultant Mr Colin Davis — who provided my husband and I with the most phenomenal clinical and emotional care throughout our fertility treatment and miscarriages — for letting me grill him with a barrage of questions, helping me to understand so much more about the clinical terminology around pregnancy loss. Massive thank you to Dr Larisa Corda for her time to offer her perspective on the language of pregnancy loss from the clinician’s point of view. And thank you to the team @ Tommy’s for sharing such useful insight about the incredible work they’re doing. And most of all, thank you to all the women and men who shared your stories with me — you are warriors, and are making such a difference by talking so openly about your experiences of pregnancy and baby loss.